End-of-Life Care for Older People in Acute and Long-Stay Care Settings. A report on the seminar, End-of-Life Care for Older People in Acute and Long-Stay Care Settings in Ireland. The Seminar took place on April 17, 2008 in Croke Park Seminar Centre, Dublin. ItI attracted over 100 delegates from across the statutory, voluntary and private sectors. and quality of life issues. 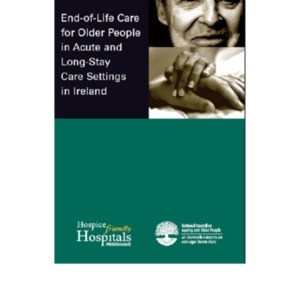 Yvonne McGivern (Editor), “End-of-Life Care for Older People in Acute and Long-Stay Care Settings in Ireland,” Archives Hospice Foundation, accessed April 22, 2019, http://archives.hospicefoundation.ie/document/132.